Ready to get serious about cleaning out your home’s patio, deck, siding, or fencing? Let the experts at Suffolk County Gutters take your home’s surfaces from grimy to great! Dirty surfaces can make your home or property look uncared for, which can lead to lower property value and general dissatisfaction about your home’s appearance. While many people think their surfaces are in poor condition, something that would cost a lot of money to fix or improve, in actuality the situation is usually not as bad as they think. Professional pressure washing services can do wonders for your home! Ready to make your patio and deck look like new? Sick of dirty siding that never seems to get clean? Does your fence’s current situation make you sweat about having to get out a brush and paint? Fix it with Suffolk County Gutters professional power washing services! While there are plenty of power washers that are available to purchase at your local hardware stores, many of these don’t get the job done and are really just glorified nozzles for your hose. Professional power washers are expensive to buy and, considering how frequent you really need to power wash (maybe just once a season at best), are really not worth the investment. Let us bring quality pressure washing services to your home. Forget about spending large amounts of money buying your own equipment. Don’t stress about learning how to use a pressure washer properly. Leave the mess to us. You will be amazed at how good your home looks once we finish an afternoon of pressure cleaning! 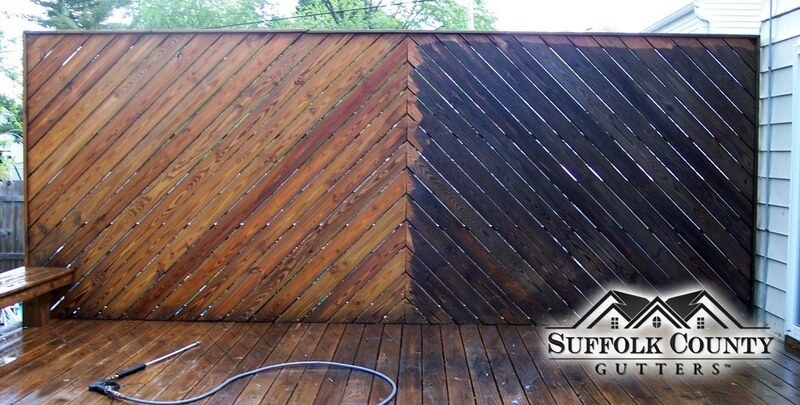 Give us a call today and schedule an appointment for your professional power washing session with the best in the business – Suffolk County Gutters!